I’m starting a new set of recurring blog posts: Fashion Focus, where I’ll write about the cute dresses/shoes/makeup/hairstyles that I come across. I’ve been meaning to do this for some time, but (again) never got around to it. 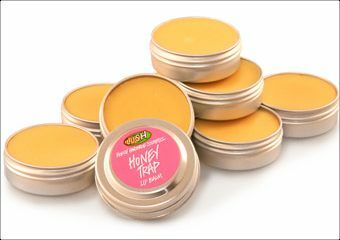 To start things off, here’s a product I adore: Lush’s Honey Trap Lip Balm. It contains honey, white chocolate and shea butter to give you smooth and deliciously yummy lips. It’s by far the best lip balm I’ve ever used and it smells gorgeous. I’ve also tried the other two lip balms (Lip Service and Whipstick) mentioned on the Lush site, but they didn’t suit me as well as Honey Trap. Lip Service is specially for dry, rough lips and it really moisturizes a lot. The main ingredients are cocoa butter, shea butter, and tangerine oil. Whipstick is for those people who are allergic to cocoa butter and lanolin, and smells like chocolate orange. I’m guessing I’m not that much of a fan of these two, because of the orangey/tangerine smell they have. If you don’t mind that though, I suggest trying them out, cause (smells aside) they’re great lip balms. There were also two other balms, but I can’t find them on the UK site (they are still available on the US site though and I saw them last week in one of the actual store). Lip Squeak smells like apple pie, and contains apples, vanilla, lemon and poppy seed oil. Lite Lip is a lighter type of lip balm which contains marshmellow herb, rose and cocoa butter. Each of the lip balms cost £4.40 ($8.75), a bit pricier than your standard Nivea/Labello lip balm, but completely worth it. If you want to try them out, just go to one of the Lush stores; the store clerks are always helpful and ready to let you try out stuff (if you’re not too sure about a product, just ask for a sample to take home; they’re really great with that).